After long cooking, I extract the chicken, discard bones, skin and unidentifiable bits only my dog would find appetizing, and put the meat back in the soup. 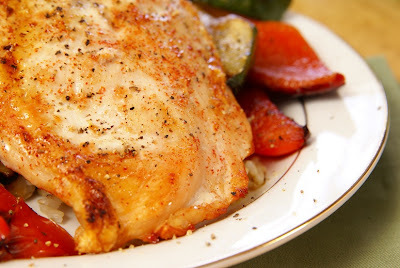 The meat is so tender by that point that it literally shreds �... To bake: Place prepared chicken breast in a baking dish. Bake in a hot (450 degree) oven for 15-20 minutes. Use a cooking thermometer to measure the temperature at the thickest part of the breast, it should be between 160-170 degrees F.